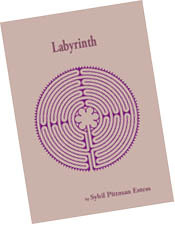 Walking the Labyrinth is Sybil Pittman Estess’s third book of poetry. Former books were Seeing the Desert Green (Latitudes Press) and Blue, Candled in January Sun (Word Tech Communications). Her other books include Elizabeth Bishop and Her Art, co-edited essays on Elizabeth Bishop (University of Michigan Press), and In a Field of Words (Prentice Hall), a creative-writing textbook co-written with Janet McCann. She has an anthology of contemporary multi-cultural writings in three genres, Common Ground. Estess is widely published in such journals as The Paris Review, Shenandoah, Southern Poetry Review, Western Humanities Review, The Texas Review, Concho River Review, New Texas, Windhover, Rattle, and other journals. Estess’s website is sybilestess.com, and she can be reached at sybilestess@aol.com. — Barbara Crooker, author of Radiance, winner of the Thomas Merton Poetry Prize. the sublime she’d tried to reach in many dreams. She’s built a house and moved there to the peak. She can see all the bright sights she’d longed for. to resemble an Ernst or a Magritte. to his lost life much too long. water. Gone, gone is all holy air.